MEDIA ROOTS – Support to repeal the National Defense Authorization Act of 2012 (NDAA) is growing as the Bush-Obama administrations continue to pursue the ongoing global ‘War on Terror’ of nearly twelve years. Pulitzer Prize winning journalist Chris Hedges is on the front lines of the battle to nullify section 1021 – the indefinite detention clause of the NDAA – along with professor Noam Chomsky, activist Daniel Ellsberg, and author Naomi Wolf. Less than one month after President Obama signed the bill into law, this astute group sued the federal government for clauses that are, at best, constitutionally vague. Consequentially, Manhattan Federal Court temporarily sided with the plaintiffs by having issued an injunction on the indefinite detention clause which has since been appealed by the Obama administration. The call to nullify the NDAA continues to surge around the country. Last month, the Clark County Republican Party Central Committee of Nevada unanimously called for its appeal while legislators in Michigan are currently considering a bill that could virtually revoke the federal law in that state. TRUTHDIG – [Section 1021] of the NDAA, signed into law by Obama on Dec. 31, 2011, obliterates some of our most important constitutional protections. It authorizes the executive branch to order the military to seize U.S. citizens deemed to be terrorists or associated with terrorists. Those taken into custody by the military, which becomes under the NDAA a domestic law enforcement agency, can be denied due process and habeas corpus and held indefinitely in military facilities. Any activist or dissident, whose rights were once protected under the First Amendment, can be threatened under this law with indefinite incarceration in military prisons, including our offshore penal colonies. The very name of the law itself—the Homeland Battlefield Bill—suggests the totalitarian credo of endless war waged against enemies within “the homeland” as well as those abroad. In May, Judge Forrest issued a temporary injunction invalidating Section 1021 as a violation of the First and Fifth amendments. It was a courageous decision. Forrest will decide within a couple of weeks whether she will make the injunction permanent. Barack Obama’s administration has appealed Judge Forrest’s temporary injunction and would certainly appeal a permanent injunction. 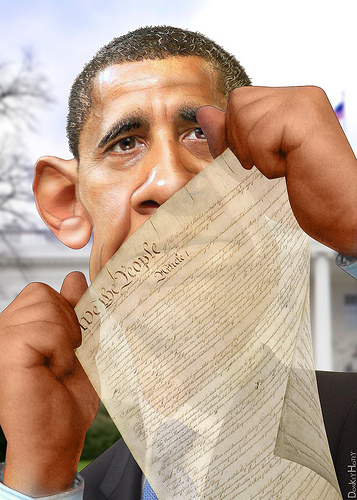 It is a stunning admission by this president that he will do nothing to protect our constitutional rights. The administration’s added failure to restore habeas corpus, its use of the Espionage Act six times to silence government whistle-blowers, its support of the FISA Amendment Act—which permits warrantless wiretapping, monitoring and eavesdropping on U.S. citizens—and its ordering of the assassination of U.S. citizens under the 2001 Authorization to Use Military Force, or AUMF, is a signal that for all his rhetoric, Obama, like his Republican rivals, is determined to remove every impediment to the unchecked power of the security and surveillance state. I and the six other plaintiffs, who include reporters, professors and activists, will most likely have to continue this fight in an appellate court and perhaps the Supreme Court. Read Chris Hedges’ complete article at Truthdig. Photo provided by Flickr user DonkeyHotey. The NDAA indefinite detention clause is, on its face, unconstitutional. were not to be obeyed. Disobedience, of course, had consequeces.